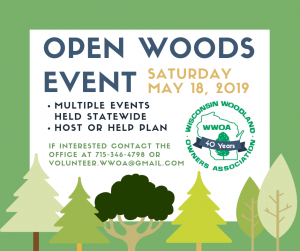 Wisconsin by participating in our 40th Anniversary Open Woods Events on May 18, 2019. Open Woods is a special day where WWOA members will welcome the public to their woodlands. The event is a way to educate and encourage other private woodland owners and family forest landowners to manage their woodlands and practice sustainable forestry. Many WWOA members throughout Wisconsin are opening their land to the public to showcase how they have improved their land through management. They each have different activities planned to help complement their property, all of which will be fun and family-friendly! There’s no better way to spend the day than with family, friends, and your neighbors in the great outdoors! COMING SOON – Click on the county name in GREEN to view a flyer! 9 am – 1 pm: Walk through the woods with an experienced Forester & identify trees, plants, and animals. Snacks and coffee provided. Feel free to bring a picnic lunch! 9 am – 12 pm: Walk the property with a forester, count rings on tree cookies, and make bark & leaf rubbings. 9 am – : Tour around the property with WIDNR & private Foresters, identify trees, and much more. Snacks, drinks, and desserts provided. Feel free to bring a sack lunch! 9 am – 1pm: Walk with the landowners to discuss trees, plants, and management techniques. Coffee, desserts, and water provided. Feel free to bring a picnic lunch! 9 am – 1pm: Walk through the property with an experienced forester, identify trees, and view a recently harvested area. 9 am – : Multiple speakers/tour guides for the property from Natural Resource Conservation Service, US Fish & Wildlife Service, DNR, and Quality Deer Management Association. Make natural bird feeders, go on a scavenger hunt, and complete a healthy soil coloring book! 9 am – 12 pm: Enjoy the beauty of Wisconsin’s private woodlands, learn about forests and their impact on the environment, ask how to manage your forest, and tons of kids activities including a horse-drawn wagon ride! 9 am – : Walk through the property and learn about the different management practices to keep the forest healthy! 9 am – 12 pm: Learn about trees and their importance to wildlife, how the area would look with out deer, and view the old hemlock stand present. Lots of kid-friendly activities and items to take home! 9 am – 2 pm: Tour through a property that has been in Managed Forest Law (MFL) for 44 years! Walk through the woods with experienced foresters – better than a walk in the park! Handicap accessible tours available! 9 am – 12 pm: Walk through a multi-award winning property with a current AND original forester of the property. View harvest records and mounts of different animals taken from this woodland. 9 am – : View all the different things this 400 acre Century Farm property has to offer! Multiple tours with experienced foresters and information from a local beekeeper on display. Handicap accessible tours available! 9 am – : Join a guided tour of this award-winning property including different self-designed logging equipment! There will also be a marked trail to help you identify trees and count rings on tree cookies to estimate age of a tree. 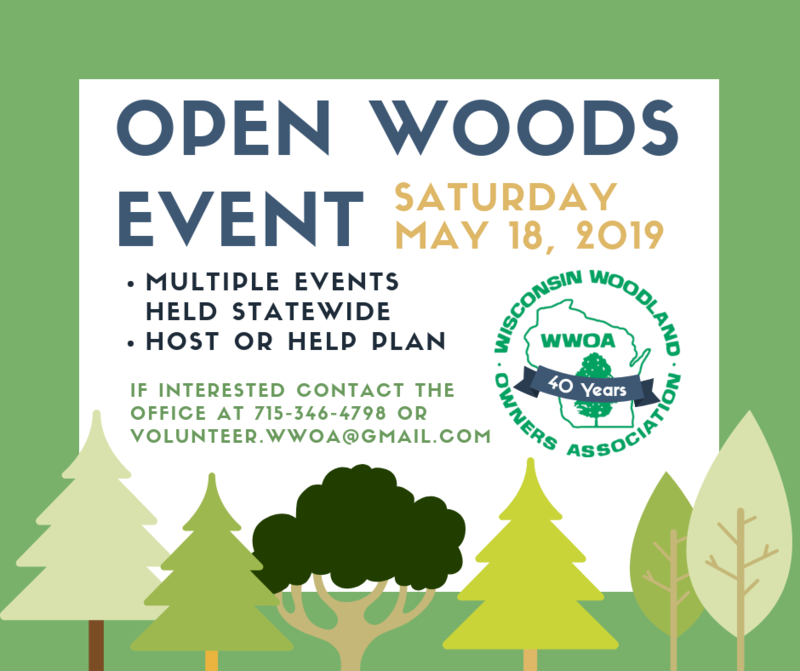 Please contact Sarah, the volunteer coordinator at volunteer.wwoa@gmail.com or 715-346-4798 if you would be interested in being an Open Woods Host or assisting with the planning for an event near you.